In an EZSqueezie bottle Designed to keep air out and glue fresh 100 watersoluble glue dries in minutes, holds firmly until moistened or washed, and does not feel stiff when dry. 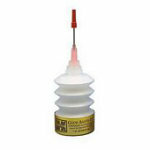 A syringe applicator allows controlled placement of droplets of glue. Contains no dyes, waxes or harmful chemicals, and is pH neutral. Use for temporary basting on appliques, hems, bindings and anywhere you would normally use pins.